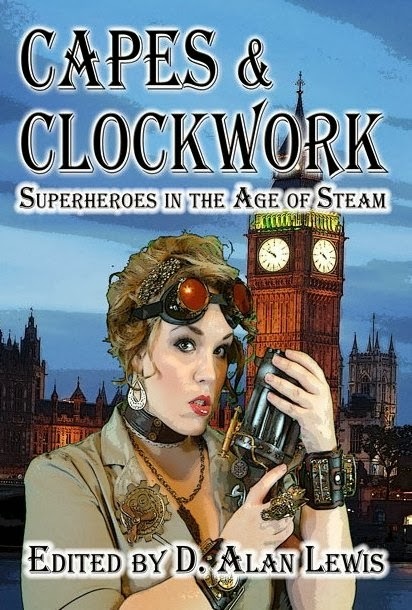 Steampunked Superheroes are on the scene. When it comes to entertainment, we live for all things new and exciting. And should a new fad come along that excites us, then we find ourselves mixing everything else we love with it. So it wasn’t a surprise that many artists have been combining their love of comic books with the growing popularity of Steampunk. That was the real inspiration behind this collection of stories. For years now, drawings and paintings of some of the most beloved comic heroes, such as Batman, Wonder Woman, Supergirl, the X-Men, and so many more have been ‘Steampunked’. A simple online search will bring up hundreds of images of our heroes, re-imagined with steam and clockwork. What makes a Superhero? At their core, they are just regular folks who want to do something good for their community. What makes them ‘super’ can be anything the author thinks up and the reader accepts. Centuries ago, mankind needed gods and heroes, partly to explain the mysteries of how our world works, but also as a way to inspire and entertain the youth. Stories of heroes that fought terrible monsters and saved humanity were passed from one generation to the next. There is a reason those myths are still known to us, they worked then and still do now. Each year, more and more movies, books, and such are made about the gods of old. But in our modern world, we’ve moved away from the ideas of gods and myths. They’re old fashion now-a-days and have been replaced by fictional people with superhuman powers, skills, or in some cases, other-worldly origins. They were first brought to us in the pulp novels of the early 20th century, then drawn out in the comic books and eventually turned into blockbuster movies. So the question is, why ‘Steampunk’ them? The answer is simple: Why not? With the growing popularity of the Steampunk genre, there is plenty of room for stories of all types. Steampunk doesn’t have to be all about airships, corsets, and romance. The more the genre grows, the more diverse people will expect their tales to be within it. With the number of comic book fans growing every year, this book will hopefully give them a new source for ‘Super’ entertainment outside of the traditional comic books formats. Centuries ago, mankind needed gods and heroes, partly to explain the mysteries of how our world works, but also as a way to inspire and entertain the youth. Stories of heroes that fought terrible monsters and saved humanity were passed from one generation to the next. There is a reason those myths are still known to us, they worked and still do. Each year, more movies, books, and such are made about the gods of old.